The U.S. Constitution and other laws have attempted to draw lines separating certain official government functions from the nation’s religious life. But these same laws have largely steered clear of regulating religion in the political sphere. And indeed, religion has long been entangled in the nation’s politics and its political campaigns. This election season comes at a time when there is evidence that the country is becoming less religious. At the same time, roughly three-quarters of Americans (77%) still identify with a religious group, and a growing number of people in both parties want their political leaders to publicly discuss their faith. As the 2016 presidential contest continues to heat up, with the Iowa caucus just days away, the Pew Research Center has once again released a new survey attempting to gauge the current state of the relationship between faith and politics. Here are key findings from the new report. 1 Roughly two-thirds of Republicans – as opposed to about four-in-ten Democrats – say it is important for a president to share their religious beliefs. However, Donald Trump — a candidate many Republicans view as a potentially good or great president —is seen by many in the GOP as not being a very religious person compared with other leading candidates. Just 44% of Republicans and those who lean Republican say Trump is “somewhat” or “very” religious. 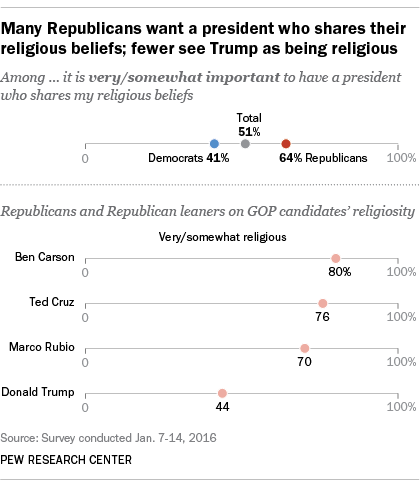 2At least six-in-ten Americans and seven-in-ten Republicans and Republican leaners view Ben Carson, Ted Cruz and Marco Rubio as being at least somewhat religious. This level of religiosity is more in line with the GOP electorate; more than eight-in-ten Republicans and Republican leaners say that religion is at least somewhat important in their lives, including 61% who say it is very important. 3Americans see the two leading Democratic candidates – Hillary Clinton and Bernie Sanders – as being less religious than their Republican counterparts (with the exception of Trump). Clinton is perceived as being somewhat or very religious by roughly half of the general public (48%), although among Democrats and those who lean Democratic, 65% see her as at least somewhat religious. Sanders, is seen as being somewhat or very religious by 40% of the general public and roughly half of Democrats and Democratic leaners (47%) even though he has described himself as Jewish but “not particularly religious” and is particularly popular among people with no religious affiliation. 4Americans’ opposition to a gay or lesbian candidate has dropped by 20 percentage points since 2007, when a Pew Research Center poll found that nearly half of Americans (46%) said they would be less likely to support a gay candidate. Only a quarter of adults (26%) now say they would be less likely to support a gay or lesbian presidential candidate. Among Republicans and those who lean Republican, the share saying that they would be less likely to support a gay or lesbian candidate for president has dropped from 62% in 2007 to 38% today. 5 Half of all Americans say religious conservatives exert too much control over the Republican Party, while slightly fewer (44%) say secular liberals have too much influence over the Democratic Party. These views are significantly influenced by partisanship. Roughly two-thirds of Republicans and those who lean Republican (68%) say secular liberals are too influential in the Democratic Party, while exactly the same share of Democrats and Democratic leaners (68%) believe religious conservatives exert too much influence over the GOP. Both groups are far less likely to express these views about their own party.